The Great Recession created some clear winners and losers. Advanced economies’ growth rates tanked after 2007, while many emerging and developing markets’ economies continued to soar. This divergence in fortunes has had a major impact on whether people in these countries are satisfied with their lives today and optimistic about the years ahead. Here are five takeaways from a new Pew Research Center report from its 43-nation survey on life satisfaction around the world. 1 On average, richer countries are happier, but only up to a point. As GDP per capita increases in a country, so does the percentage of people who rate their life at seven or higher on a ladder where 0 represents the worst possible life and 10 represents the best possible life. But, among richer nations, the increase in happiness due to higher incomes tends to taper off. For example, a majority of Malaysians (56%) rate their life at seven or higher, considerably more than the much poorer Bangladeshis (34%). However, Germans (60%) – who are far richer than Malaysians – are only somewhat more satisfied with their current life situation. 1Economic growth helped improve feelings of well-being. 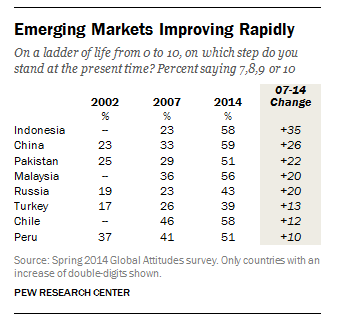 People in emerging markets – many of which have experienced strong economic growth over the past seven years – are much happier today than in 2007. This is especially the case in Asian emerging nations, such as Indonesia, China, Pakistan and Malaysia. But big gains in life satisfaction have also happened in Russia, Turkey, Chile and Peru, all of which also experienced healthy growth since 2007. 2 But money isn’t everything. People prioritize nonmaterial things – such as good health and a quality education for their child – as most important in life. A median of roughly two-thirds of people across the emerging and developing countries surveyed rank their health (68%) and their children’s education (65%) as a 10 – very important – on a 0 to 10 scale. Safety from crime (64%) and owning their home (62%) are nearly as important, while a fulfilling job (53%) and financial security in retirement (53%) are close behind. 3 Social and political upheaval takes a heavy toll on individuals’ life satisfaction. For example, Egyptians today are much less happy with their lives (11% say seven or higher) than they were in 2007 (25%). Similarly, Ukrainians – after years of steady improvement in reported life satisfaction – are nearly back to where they were in 2002 (23% today vs. 19% in 2002). 4People in Asia and Africa are the most optimistic about the future – Middle Easterners are the least. When asked to rate where they think they will stand on the ladder of life five years from now, a median of 68% across the Asian publics surveyed expect to be higher on the ladder than they are today. People in African countries are also very optimistic (median of 66%). Meanwhile, just half of people in the Middle East think they will be better off in five years – and a quarter believes things will be worse for them personally.